Background and objectives: Age-related macular degeneration is a condition that leads to the deterioration of the macula in older adults, and is characterized by the presence of drusen and degenerative changes of the retinal pigment epithelium and choroidal capillaries. It is a major cause of blindness worldwide. The commonly used strategies, including antioxidant therapy and dilation of blood vessels, have shown undesired outcomes in clinical practice. Ranibizumab, an anti-vascular endothelial growth factor fusion protein, is an angiogenesis inhibitor that has been used to treat wet (neovascular) age-related macular degeneration; however, patients treated with ranibizumab are prone to develop endophthalmitis, rhegmatogenous retinal detachment, retinal tears, and iatrogenic traumatic cataract. Therefore, we aim to determine the efficacy and safety of combined intravitreal injection of triamcinolone acetonide and ranibizumab in the treatment of age-related macular degeneration in a randomized trial. Methods: Eighty patients (160 eyes) with age-related macular degeneration admitted at Jingzhou Hospital affiliated to Tongji Medical School of Huazhong University of Science and Technology, China will be recruited. These patients will be randomly assigned to control or treatment group at a 1:1 ratio. The patients in the control group will be treated with intravitreal injection of triamcinolone acetonide (0.1 mL, once daily), while those in the treatment group will be treated with combined intravitreal injection of triamcinolone acetonide (0.025 mL, once daily) and ranibizumab (0.05 mL, once a month). All patients will undergo continuous treatment for 3 months, followed by a 6-month follow-up. 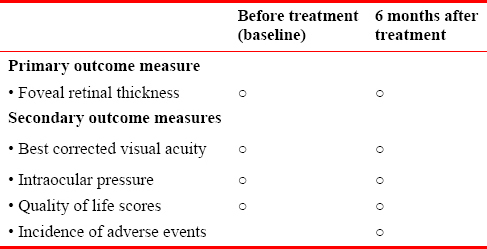 Outcome measures: The primary outcome measure is foveal retinal thickness before and 6 months after treatment. The secondary outcome measures include best corrected visual acuity, intraocular pressure, quality of life scores before and 6 months after treatment, and the incidence of adverse events at 6 months after treatment. Discussion: We aim to confirm the safety and efficacy of the combined intravitreal injection of triamcinolone acetonide and ranibizumab in the treatment of age-related macular degeneration. Ethics and dissemination: This study was approved by the Ethics Committee of the Jingzhou Hospital Affiliated to Tongji Medical School of Huazhong University of Science and Technology, China (approval No. 20170338), and will be performed in accordance with the Declaration of Helsinki. The participants will be informed of the study protocol and procedures and asked to sign an informed consent. Participant recruitment will be initiated in January 2018. Sample and data collection will begin in January 2018 and end in June 2018. The analysis of outcome measures and the completion of trial will be in September 2018. The results of this study will be disseminated through presentations at scientific meetings and/or by publication in peer-reviewed journals. Trial registration: This trial was registered with the Chinese Clinical Trial Registry (registration No. ChiCTR-IOR-17013865). In China, the prevalence of age-related macular degeneration is increasing yearly with increasing age., Currently, there is no effective treatment for age-related macular degeneration.,,,,, Antioxidants and blood vessel dilators have been prescribed by most doctors with little effect. The purpose of this study is to validate the safety and efficacy of combined intravitreal injection of triamcinolone acetonide and ranibizumab in the treatment of age-related macular degeneration. A prospective, single-center, randomized controlled trial will be conducted in the Jingzhou Hospital Affiliated to Tongji Medical School of Huazhong University of Science and Technology, China. The study population comprises 80 patients (160 eyes) with age-related macular degeneration who will be randomized into two groups to receive intravitreal injection of triamcinolone acetonide alone (control group) or in combination with ranibizumab (treatment group) for 3 continuous months. All the patients will be followed up for 6 months [Figure 1]. Jingzhou Hospital Affiliated to Tongji Medical School of Huazhong University of Science and Technology, China. Eighty patients (160 eyes) with age-related macular degeneration from clinics and wards receiving treatment in the Jingzhou Hospital Affiliated to Tongji Medical School of Huazhong University of Science and Technology will be enrolled in this study. A leaflet printed with the details of the study will be distributed to inpatients, outpatients, and their families. The patients and their families who are interested in this research project can contact the project manager by telephone. Eligible patients will sign the written informed consent prior to participation in the trial. A random number table will be generated by the first author using the SPSS 13.0 software (SPSS, Chicago, IL, USA). Patients will be numbered according to the visiting sequence. Eligible patients with odd-number hospital records will serve as the control group (40 patients with 80 eyes), while those with even-number records will serve as the treatment group (40 patients with 80 eyes). This study is an open trial, and all the participants will be aware of grouping and assessment. The patients in the control group will receive intravitreal injection of 1 mL triamcinolone acetonide (specifications 1 mL:40 mg, produced by Bristol-Myers Squibb Company, Italy, with the product batch No. 111013), once daily. The patients in the treatment group will receive combined intravitreal injection of triamcinolone acetonide (0.025 mL once daily) and 0.05 mL of ranibizumab (specifications 10 mg/mL, 0.2 mL per bottle, produced by Novartis Pharma Schweiz AG, Switzerland) once a month. The treatments in both groups will last for 3 months. Foveal retinal thickness before and 6 months after the treatment will be measured using an OCT-1000 scanner (Chenxu Telecommunications Technology Co., Ltd., Guangzhou, China). A higher value indicates more severe macular degeneration. The best corrected visual acuity before and 6 months after treatment will be tested by professional doctors. Intraocular pressure before and 6 months after treatment will be tested using a non-contact tonometer (Wufang Medical Devices Co., Ltd., Nanchang, China). The incidence of adverse events at 6 months after treatment: Incidence of adverse events = the number of patients presenting with any adverse events/the total number of patients × 100%. The schedule of outcome measurement assessments is shown in [Table 1]. We will record adverse events, including endophthalmitis, rhegmatogenous retinal detachment, retinal tears, iatrogenic traumatic cataracts, low back pain, transient blurred vision, elevated intraocular pressure, macular hemorrhage, and loss or loosening of fixation during follow-ups. If severe adverse events occur, the date of occurrence, type of events, and measures taken to treat the adverse events will be reported in detail to the principle investigator and the Institutional Review Board within 24 hours. The study protocol should be approved by the Ethics Committee of the Jingzhou Hospital Affiliated to Tongji Medical School of Huazhong University of Science and Technology in China, and a protocol agreement should be signed. During participant recruitment, regular audits will be necessary to ensure the eligibility of participation, strict implementation of the study protocol, and integrity of related data. At the end of all trial procedures, a final visit will be indispensable to avert the omission of relevant records. All data will be statistically analyzed using the SPSS13.0 software (SPSS, Chicago, IL, USA) and follow the intention-to-treat principle. Normally distributed measurement data will be expressed as the mean ± SD and non-normally distributed measurement data will be expressed as lower quartile (q1), median, and upper quartile (q3). Count data will be expressed as percentage. Two-sample t-test will be used to compare foveal retinal thickness, best corrected visual acuity, intraocular pressure, and quality of life scores between the two groups. Paired t-test will be used for intragroup comparison of the above-mentioned indicators before and after treatment. A Pearson’s correlation analysis will be used to compare the incidence of adverse events between the two groups, with a significant level of α = 0.05 (two-sided). Based on our experience, we hypothesize that the foveal retinal thickness in the treatment and control groups will be decreased by 200 and 150 μm, respectively, with a standard deviation of 100 μm. Taking β = 0.1, power = 90%, and α = 0.05 (two-sided), the final sample size of 86 eyes per group was calculated using the PASS 11.0 software (PASS, Kaysville, UT, USA). Considering a loss rate of 20%, 40 cases (80 eyes) per group will be included in the study. The baseline data of the included patients are shown in [Table 2]. The case report form of each enrolled case should be completed by researchers and audited by an inspector. Data entry and management will be performed. After data transfer, the contents recorded in the case report form will not be modified. The database is locked by the data manager. Generally, locked database or files will not be altered. During the clinical trial, sponsor inspectors will conduct regular periodic visits to the research center to ensure strict adherence to all aspects of the research program. In addition, the original data will be checked to ensure that the contents of the case report forms are true, complete, and accurate. This clinical trial follows the relevant laws and regulations of the Declaration of Helsinki. This manuscript is prepared and modified according to SPIRIT guidelines (Additional file 1 [Additional file 1]). The researchers take the responsibility of providing the independent ethics committee with the clinical trial protocol and informed consent forms to obtain an independent approval for the implementation of the clinical trial. The trial cannot be initiated until approval is received from the ethics committee. This study was approved by the Ethics Committee of the Jingzhou Hospital Affiliated to Tongji Medical School of Huazhong University of Science and Technology in China (approval No. 20170338). Recruitment of patients will begin in January 2018. The analysis of outcome measures and completion of trial will be in September 2018. There is no effective treatment for age-related macular degeneration. Ranibizumab has been used in the treatment of wet (neovascular) age-related macular degeneration; however, it is associated with many adverse reactions. 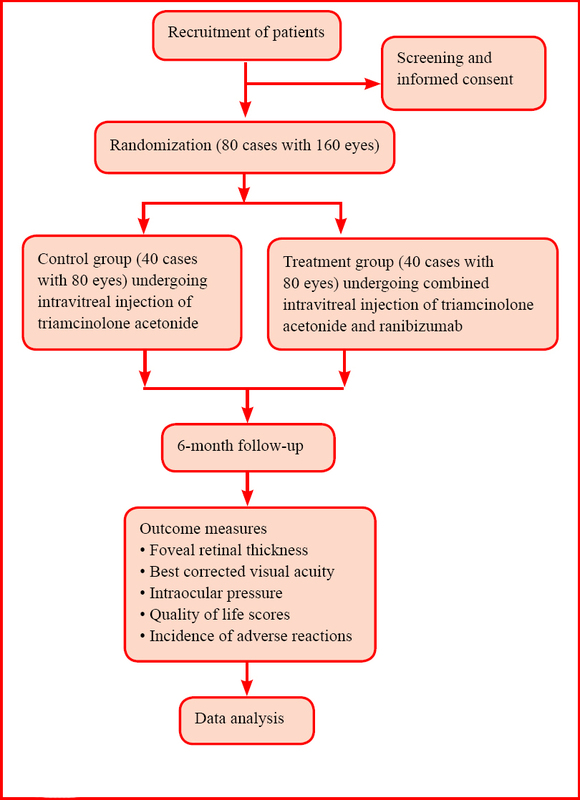 This is a prospective, randomized controlled trial aiming to evaluate the efficacy and safety of combined intravitreal injection of triamcinolone acetonide and ranibizumab for the treatment of age-related macular degeneration, through a systematic observation of the clinical efficacy of the combined therapy and posttreatment adverse reactions. In this study, we attempt to confirm that the combined intravitreal injection of triamcinolone acetonide and ranibizumab can effectively reduce foveal retinal thickness, improve corrected visual acuity, improve quality of life, and reduce incidence of adverse reactions in patients with age-related macular degeneration. Thus, the combined treatment of triamcinolone acetonide and ranibizumab is expected to be an effective therapeutic method for age-related macular degeneration with desired outcomes in the future. Bruè C, Pazzaglia A, Mariotti C, Reibaldi M, Giovannini A. Aflibercept as primary treatment for myopic choroidal neovascularisation: a retrospective study. Eye (Lond). 2016;30:139- 145. Pacella E, Pacella F, Mazzeo F, et al. Effectiveness of vision rehabilitation treatment through MP-1 microperimeter in patients with visual loss due to macular disease. Clin Ter. 2012;163:e423-428. Antoniak K, Bienias W, Nowak JZ. Age-related macular degeneration-a complex genetic disease. Klin Oczna. 2008;110:211-218. Oda H, Ohkawa S, Maeda K. Hemispatial visual defect in Alzheimer’s disease. Neurocase. 2008;14:141-146. Kawagoe N, Takahashi M, Mandai M, et al. Peripherin/RDS gene mutation in a patient with choroidal neovascularization. Nippon Ganka Gakkai Zasshi. 2007;111:336-342. Xu L, Wang Y, Li Y, et al. Causes of blindness and visual impairment in urban and rural areas in Beijing: the Beijing Eye Study. Ophthalmology. 2006;113:1134.e1-11. Smith AG, Kaiser PK. Emerging treatments for wet age-related macular degeneration. Exp Opin Emerg Drugs. 2014;19:157-164. Vadot E, Durand L, Remy C. Late course of cicatricial chorioretinitis with paramacular localization. Bull Soc Ophtalmol Fr. 1979;79:15-16. Hu JY, Yan L, Chen YD, et al. Population-based survey of prevalence, causes, and risk factors for blindness and visual impairment in an aging Chinese metropolitan population. Int J Ophthalmol. 2017;10:140-147. Tong XW, Zhao R, Zou HD, et al. A prevalence investigation of blindness and vision impairment in 2009 in older adults of Dachang Blocks of Baoshan District, Shanghai, China. Zhonghua Yan Ke Za Zhi. 2011;47:785-790. Aujla JS. Replacing ranibizumab with bevacizumab on the phar- maceutical benefits scheme: where does the current evidence leave us? Clin Exp Optom. 2012;95:538-540. Małgorzata F. Effectivity and safety of bevacizumab intravitreal injections for exudative age-related macular degeneration treatment-6 months observations. Klin Oczna. 2010;112:213-216. Kakkassery V, Winterhalter S, Joussen AM. Anti-VEGF inhibitors and their role in the treatment of diabetic macular oedema. Klin Monbl Augenheilkd. 2010;227:701-711. Akens MK, Hardisty MR, Wilson BC, et al. Defining the therapeutic window of vertebral photodynamic therapy in a murine pre-clinical model of breast cancer metastasis using the photosensitizer BPD-MA (Verteporfin). Breast Cancer Res Treat. 2010;119:325-333. Lubczyńska A, Kociecki J. Inhtravitreal triamcinolone acetonide injections in the treatment of cystoid macular edema due to the central or branch retinal vein occlusion. Klin Oczna. 2007;109:169-172. Lubczyńska A, Kociecki J. Intravitreal triamcinolone acetonide injections in treatment of cystoid macular edema due to diabetic maculopathy. Klin Oczna. 2007;109:165-168. Machalińska A, Paczkowska E, Pabin T, Safranow K, Karcze wicz D, Machaliński B. Influence of ranibizumab on vascular endothelial growth factor plasma level and endothelial progenitor cell mobilization in age-related macular degeneration patients: safety of intravitreal treatment for vascular homeostasis. J Ocul Pharmacol Ther. 2011;27:471-475. Skelly A, Carius HJ, Bezlyak V, Chen FK. Dispensing patterns of ranibizumab and aflibercept for the treatment of neovascular age-related macular degeneration: a retrospective cohort study in Australia. Adv Ther. 2017. doi: 10.1007/s12325-017-0624-6. Karagiannis D, Chatziralli I, Kaprinis K, Georgalas I, Parikakis E, Mitropoulos P. Location of submacular hemorrhage as a predictor of visual outcome after intravitreal ranibizumab for age-related macular degeneration. Clin Interv Aging. 2017;12:1829-1833. Kaya F. Change in choroidal thickness after intravitreal injection for treatment of neovascular age-related macular degeneration: ranibizumab versus aflibercept. J Fr Ophtalmol. 2017. doi: 10.1016/j.jfo.2017.04.014. Chinese Medical Association ophthalmology eye fundus disease group. Clinical diagnostic criteria for age-related macular degeneration. Yan Di Bing. 1987. Zhang H, Lei C, Zhang TY, et al. Transcutaneous electrical acupoint stimulation with different acupoint combinations on opioid consumption in patients undergoing off-pump coronary artery bypass grafting: study protocol for a randomized double-blind controlled trial. Clin Transl Degener Dis. 2016;1:17-24. Wang Y. Chinese medicine packet plus wax therapy for periarthritis of the shoulder: study protocol for a multi-center randomized controlled trial. Clin Transl Degener Dis. 2016;1:25-31. Ma N, Peng J, Guo QY. Local administration of enriched mononuclear cells, platelets and zoledronic acid for preventing collapse of the femoral head in the early stage of osteonecrosis: study protocol for a prospective randomized parallel-controlled clinical trial. Clin Transl Degener Dis. 2016;1:32-37. FW conceived and designed the study protocol, wrote the manuscript. XLX gave some constructive suggestions for the study design. FW will complete the trial with the help of XLX. Both authors read and approved the final version of the manuscript for publication. The study protocol was approved by the Ethics Committee of Jingzhou Hospital Affiliated to Tongji Medical School of Huazhong University of Science and Technology, China (approval No. 20120630). The study will be performed in accordance with the Declaration of Helsinki. The authors certify that they will obtain patient consent forms. In the form, patients will give their consent for their images and other clinical information to be reported in the journal. The patients understand that their names and initials will not be published and due efforts will be made to conceal their identity, but anonymity cannot be guaranteed. Datasets analyzed during this study will be available from the corresponding author on reasonable request.